That’s how my breakfast looked like this morning ^ ((well late breakfast I mean, 4 hours after waking)) and it was a pure BLISS! 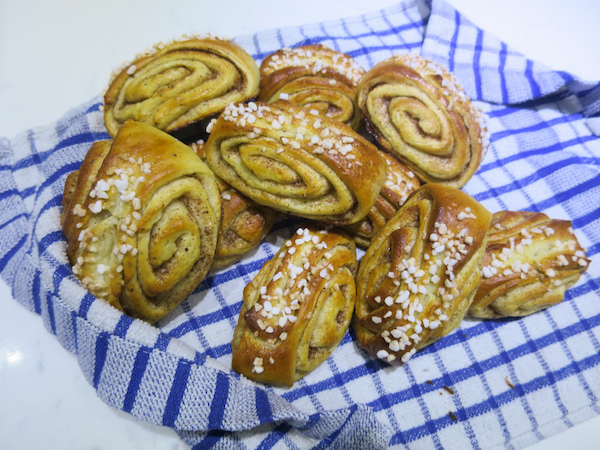 Korvapuusti – that can be translated into ‘slap on the ear’ or ‘slap in the face’ is the Finnish version of a cinnamon roll. 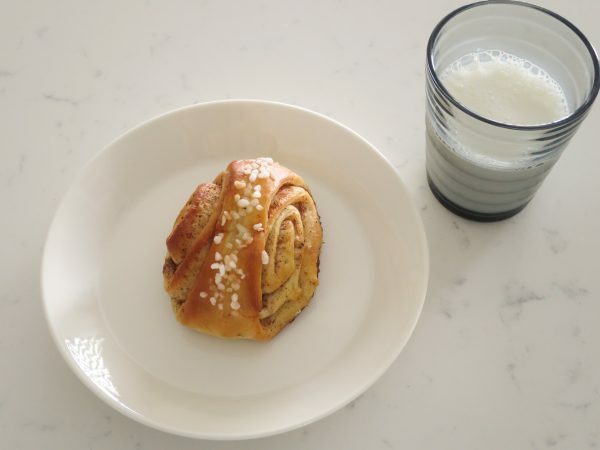 You can find it everywhere in Finland and it’s best enjoyed warm with a glass of cold milk. Some like to dip it in their coffee but for me milk is the drink to pair it with! 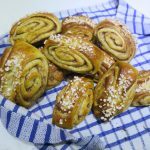 The recipe that I’m about to share with you, uses less flour than a traditional recipe – which makes them lighter, even a bit fluffy in texture. 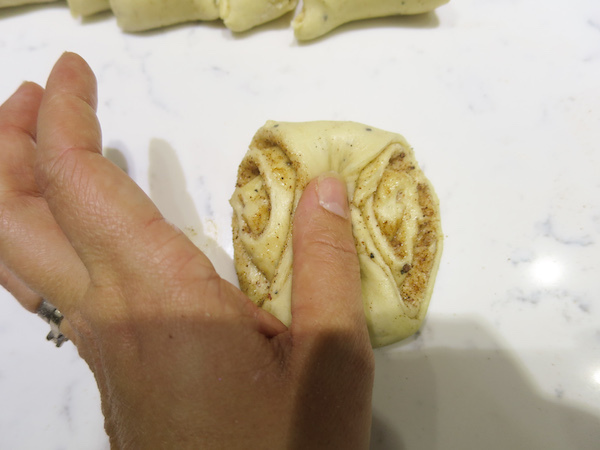 While a fresh cinnamon roll is always the best, this light texture ensures that the rolls will stay soft for at least couple more days – that is if you’ll have any left! 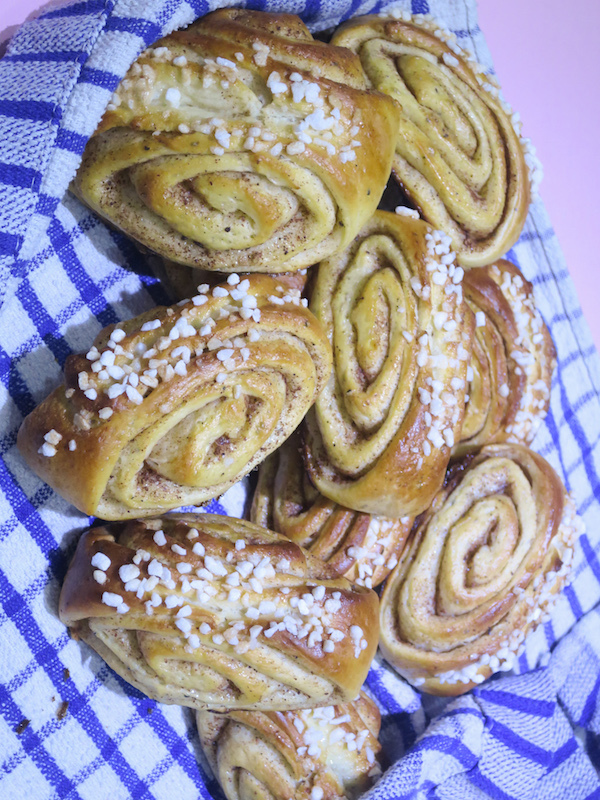 I actually made only half of the quantity as I know myself too well… I simply can’t stop eating them! Oh, and our freezer is currently full ( always smoothie ready means tons of berries, spinach and bananas to freeze!!). If you do have space in your freezer – go ahead and make a bigger batch at once, they freeze well and taste delicious after reheating in the oven (or microwave if you are in a hurry). It’s great stuff to have in your freezer to serve for surprise guests and for those days when you just need one, or two or a few, who counts?! In a mixing bowl add yeast into lukewarm milk mixing until dissolved. Add egg, salt, cardamom and about 3/4 of the flour and mix well in mixer with flat beater or by hand using a spatula. Move to working by hand and continue adding flour kneading it in. Add softened butter and continue to knead on lightly floured surface until smooth and forms a soft ball. Place in a mixing bowl, cover with a towel and leave to rise for about 30 minutes. 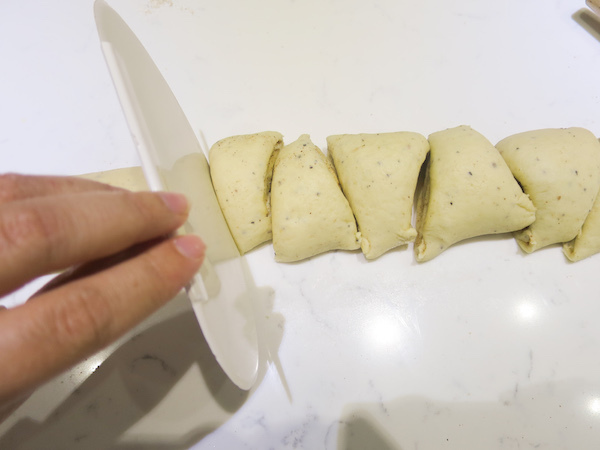 Preheat oven to 225ºC (425ºF) and prepare two baking sheets with parchment paper. 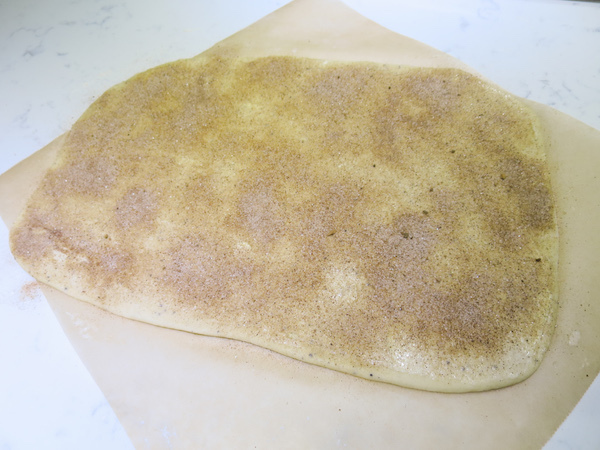 Once the dough has risen, turn it onto lightly floured surface, divide into two equally sized portions and roll each into a rectangular shape approx. 20x40 cm. 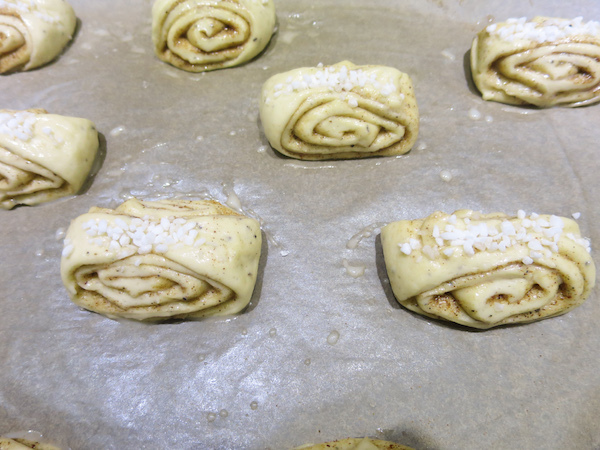 Spread softened butter over the dough and sprinkle sugar and cinnamon on top. Roll the rectangular from the long side forming into a roll, place seam down and cut into 12 cylinders in an angle. Repeat for the second portion of dough. Lift up from the narrow end and flatten it by pressing from the middle with your thumb. Place onto prepared baking sheet and cover with clean kitchen towel and allow to rise for 30 minutes. Meanwhile prepare egg wash by mixing egg, salt and milk. 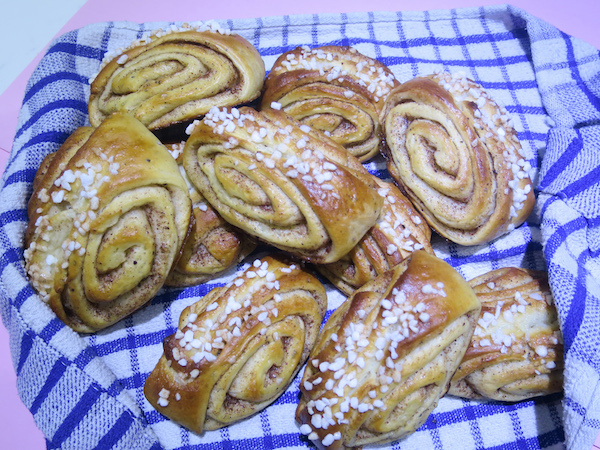 Brush the rolls with egg wash and sprinkle pearl sugar on top. Bake in preheated oven for 12 minutes or until browned on top. Serve warm, enjoy!